In our Feel Better formula, we've paired carefully selected antiseptic herbs of organic Echinacea, Lemon and Ginger Root, and pure essences of Eucalyptus and Peppermint to help boost the immune system and open up congested air passages. 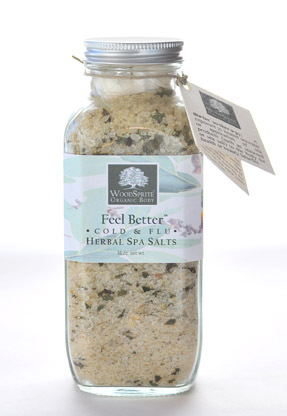 Finally, our blend of sea salts and minerals work to relieve achy or fatigued muscles to promote an overall environment and attitude of healing, so you can get back to normal, faster. How to Use: Add 1/4 to 1/2 cup of salts to muslin bag (included), tie tightly and toss into full tub, then slip into bath and Feel Better! Ingredients: Sea Salt, Epsom Salt, Dead Sea Salt, *Organic Eucalyptus, *Organic Marshmallow Root, *Organic Ginger Root, *Organic Echinacea Root, *Organic Peppermint, *Organic Lemon Peel & Pure Essential Oils of Clove, *Organic Eucalyptus and *Organic Lemon. (*Certified Organic) 100% Natural. Non-foaming -- Hot tub Safe.